the rate which has been agreed upon by the two parties. In the case of real estate deals the buyer can issue a purchase order for the seller where in the buyer must mention the building or the house, its location and the money that has been agreed upon to be paid by the buyer to the seller. 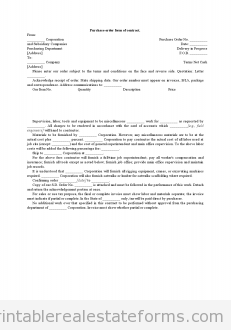 Also, the buyer must assume the purchase order form of contract to be legal and binding over the seller only when the seller has accepted the purchase order. If there is a transaction that is taking place between the members of a family then there is a need of this contract. In this contract the details of both the buyer and seller along with that of property is mandatory. Important dates, the prices insurance and any kind of conflict resolutions as well as a scope of termination f contract should be mentioned.